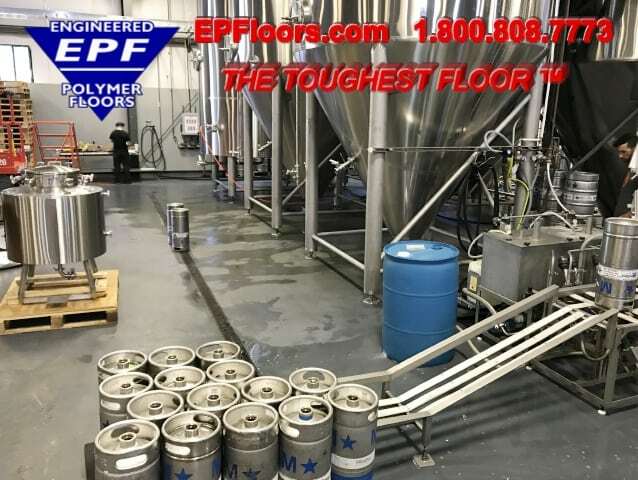 EPF specializes in high performance PUMA-CRETE® seamless urethane brewery flooring. For over 30 years, we have been serving major breweries, craft breweries, microbreweries and brew pubs, throughout the U.S. Typical areas resurfaced include brewhouse floors and fermentation areas. Renovation projects are our specialty ! Whether you are converting an existing industrial floor space into brewing operations or building a new facility, EPF provides A-Z services for your project. If your tap room requires a polished concrete finish, or decorative coatings, we can also provide this as well. EPF is different, in that we control all aspects of your flooring project. Since we are vertically integrated, we provide all necessary services related to your new floor. 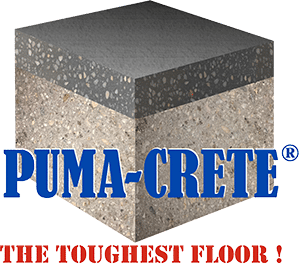 This includes expert floor consulting services, specification assistance, drainage evaluation, manufacturing of materials and installation of PUMA-CRETE® flooring with our own crews. Our turn-key services also include retrofit slope to drain flooring, curbing, slabs and trench drains. A facility owner has many flooring options for brewery and beverage floors. These include epoxy and urethane flooring. PUMA-CRETE® urethane floors offer many advantages over the competition. It looks similar to, but is not epoxy flooring. PUMA-CRETE® is a heavy duty troweled urethane floor. Applied at 1/4 inch, this system handles impact, dragging, scraping and other physical abuse. Download the PUMA-CRETE® advantages over our competition ! 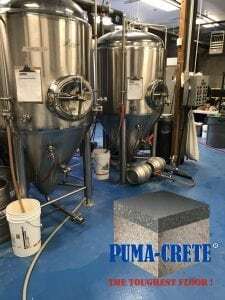 Not only does this tough PUMA-CRETE® urethane concrete flooring hold up to mechanical abuse, but it is also chemical resistant flooring. Furthermore, it has a sanitary, stain resistant finish. When wet, it provides good traction and slip resistance. It handles hot washdowns and thermal shock. Converting a commercial or industrial space with flat floors, for brewing, can be a challenge. New floor drains must be installed, and floors must be sloped in the brewhouse (Mash, Lauter, Kettle etc), bottling or canning machine area and the kegging machine area. One must weigh the costs and time required for each the following two sloping options. Remove the entire slab, disposing of the concrete, re-grading as needed. Next, the drains and plumbing must be installed. Then the entire slab must be re-poured (usually 6 inches of concrete multiplied by $150/yd plus materials and labor) note: one yard of concrete equals 54 square feet at 6 inches. Figure approximately $3 per square foot plus labor/markup. Total will easily be $10-12 per square foot just for the new slab (not including removal of old slab ~$2-3/sf ). One could easily be looking at $15 per square foot. Remove 2 foot strip of concrete where drains and lines shall be installed. Install drains, plumbing and backfill. Grind the surface of the existing slab, apply bonding agent, and then slope to drains with 5000 psi, bonded, cementitious polymer underlayment. This entire process can be as low as $7-8 per square foot complete. The entire cost of sloping and 1/4 inch PUMA-CRETE® urethane flooring will usually be less than just removing and replacing the entire slab. Time savings will be significant as well. 4000 square foot area can be completed in less than one week, finished and ready for service. How do we we slope brewery floors to drains properly? Many flooring companies are merely manufacturers, who sell their product to third party companies. EPF controls the entire process from consulting on the project, to manufacturing and application, and warranty. We control every aspect of your project, from A-Z. This ensures that quality control is maintained throughout the process, from concept to completion. We are the only company that can handle drain design and installation, sloped underlayments for renovation, and PUMA-CRETE® floor finish. EPF has invested over 1 million dollars in specialty surface prep equipment. This enables our installation team to prepare your concrete, brick or tile, for proper adhesion. All cutting, grinding and blasting equipment has special dust collection to minimize generation of dust. This ensures that the installation proceeds quickly, efficiently, and is cost effective. Your project team will be composed of a project estimator, project manager, field manager, team leader and skilled floor technicians. This chain of command creates a team that has constant interface, ensuring all specifications and quality control are maintained. 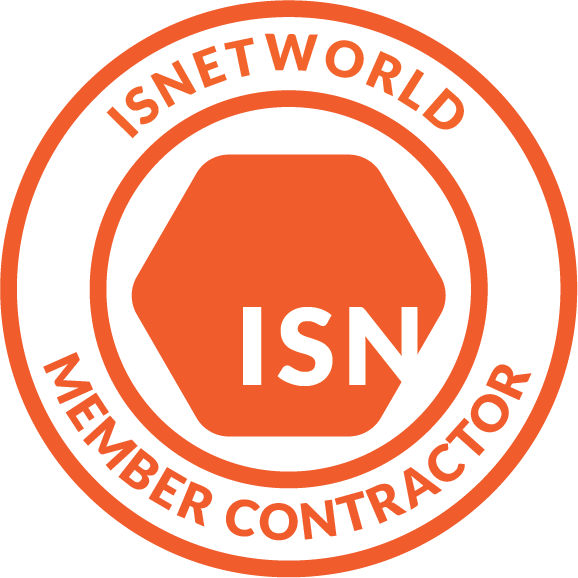 Extensive time tested checklists have been developed over the years, which provides exacting standards for quality and efficiency, every step of the installation. PUMA-CRETE® shall reduce your cleaning costs, as well as reduce bacterial growth on the floors. This flooring was developed for the brewing and beverage industries, where cleaning and sanitation are a daily concern. This food grade flooring is sanitary, and easily cleaned. Our floors are seamless, and are available with an integral cove base at the floor wall/junction, to provide a watertight “bathtub” effect. It is even suitable for certified clean room floors in food and beverage plants, ingredient storage areas, and allergen rooms. PUMA-CRETE® serves as effective antimicrobial flooring. It contains an antimicrobial additive which inhibits the growth of mold and bacteria. This shall increase the efficiency of your cleaning program. Inspections and audits of your brewery floors require the surfaces to be a dense non porous finish, free of breakage, voids, and puddles. PUMA-CRETE® will eliminate any inspection concerns. It is USDA and FDA approved flooring, and shall assist with brewery flooring compliance with the FSMA, IFS, FSSC 22000 and BRC. It meets GFSI guidelines for SQF floor certification. When dealing with a failing brick or tile floor, facility owners must decide on a repair method. Complete removal requires moving all equipment off of the area. Then, removal and disposal of all of the bricks/tiles. Often, this portion of the process can release mold and bacteria into the air, causing more contamination. In many cases, there is an alternative. If the entire tile or brick area has not yet been undermined (loose tiles over more than 1/3 of the area, then the existing floor may be salvaged. EPF shall remove all loose tiles or bricks (brick or tiles under legs of equipment must remain). Next, the removed areas are removed with high performance cementitious grout. Next, EPF diamond grinds the surface of the tile or brick. Then we apply PUMA-CRETE® over brick or tiles. The material is sealed around any legs. PUMA-CRETE® effectively seals the entire floor and provides a watertight, durable finish over the entire area.